Somehow I came across a tutorial for some cute felt paper dolls online and decided they were too cute not to make for my youngest niece. I looked up a few versions of these dolls to get an idea of how to make them. I wanted to make a little house for them, too, but I didn’t quite get that far. Maybe next year! I sketched out a body-shaped pattern on plain white paper and when I was happy with it, cut it out and traced it onto some cardstock (from junk mail). I wanted to make them a big enough size for a toddler to play with, but small enough to be portable. They ended up about 6 1/2 inches high. I decided to make three dolls. I traced the pattern onto the lightest one, then stacked up three pieces of felt and cut them all out together. I added white felt underwear for modesty. Next I added simple faces with embroidery thread and created hairstyles using felt. Each hairstyle is made of two pieces–one on the front of the head and one in back. I tried to make them cute but simple. This step was fun because it gave the dolls some personality. Next I pinned each doll to a piece of white felt for a backing. After sewing the hair and backing in place, I cut out the white felt to follow the shape of the doll. I think this was much easier than cutting the white backing first and then trying to sew it on properly. That was it for the dolls. I think they looked pretty cute, though I had some difficulty sewing the hair–the pieces were so small! Next were the dresses. Each one needed a felt backing, both for stability and to make it stick to the doll. For these, I traced my cardstock pattern onto white paper and drew a basic dress shape over it. I cut out the dress and traced it several times onto white felt. I improvised some variations in neckline and sleeve length, and also made some skirts and tops out of the same pattern. I placed each piece of felt onto a scrap of fabric and cut around it. I wish I had cut out the dress shapes first, sewed the fabric and felt together, and then cut out the felt like I did with the dolls themselves–it would have been much easier. Live and learn. For this step, I found it easier to use Wonder Clips than pins. I also tried to choose fabrics that didn’t fray too much and sewed as close to the edge as possible. I ended up making seven dresses, two skirts, two shirts, and a little ballerina outfit. I originally intended to make shoes and other accessories, but the clothes just about drove me insane. Again, I am not good at fiddly things. I put all the parts in a little organza bag and the recipient seemed pleased with them. I would definitely make these again, but next time I’ll try not to wait until the last minute. I loved Barbie as a kid, and I currently have a niece who also loves her. Although I am generally really bad at making small, fiddly things (exhibit A), I found some tutorials online that made it look fairly easy. Despite the warning voice in my head, I decided to go ahead and give it a try, starting with a very basic skirt. I went through my stash of fabric scraps and chose ones with small prints that might appeal to a little girl, then followed these instructions for my skirt. It came out a bit boxier than I wanted, so I tried shaping it a bit. Unfortunately, the result was a bit too small for Barbie. Don’t take it personally, Barbie. We’ve all been there. Defeated, I gave up for the day and decided Barbie couture was not for me. The next day, however, I returned to my sewing machine with renewed purpose and made two skirts that actually fit. They were seriously basic–just tubes of fabric with elastic–but good enough for me. Although the instructions suggest serging the raw edges, I really didn’t feel like breaking out the serger for Barbie clothes. Instead I hemmed all the edges and used tiny French seams where appropriate. Feeling more confident, I attempted this shirt. I did decided to use the serger on this, which made things much easier. This was fairly complicated and didn’t come out quite as well as the inspiration image, but it is passable. At this point, I thought I should probably give up and be happy with three decent pieces in a row. But I really, really wanted to try this cute dress. Oh, and I wanted to make it in satin. You know, so Barbie would have something to wear to prom. I really did not have high hopes for this project, but I forged ahead, fearing that I was flying too close to the sun. I am so pleased with how this turned out. It looks a bit better in person–the flash makes it look like it is bunching at the hem and for some reason the bodice looks a little lumpy. It actually fits really well. I generally followed the directions closely, though I lengthened the skirt by an inch to make it seem a bit more formal and skipped the topstitching where the skirt meets the bodice. I also sewed up most of the skirt in the back, leaving enough of an opening for Barbie to get into the dress. The little matching bag is just a folded rectangle of fabric with a tiny ribbon loop for carrying. And with this, I am retiring from Barbie couture for the time being so as to preserve my sanity and give my seam ripper a rest. I love making baby stuff, especially out of fleece. It is so forgiving, not to mention super soft and cute. Since I have two baby showers this month, I made two little fleece hats using McCall’s M4682. I used this pattern several years ago to make a hat for my niece and it turned out surprisingly well. The first shower was for a baby girl. 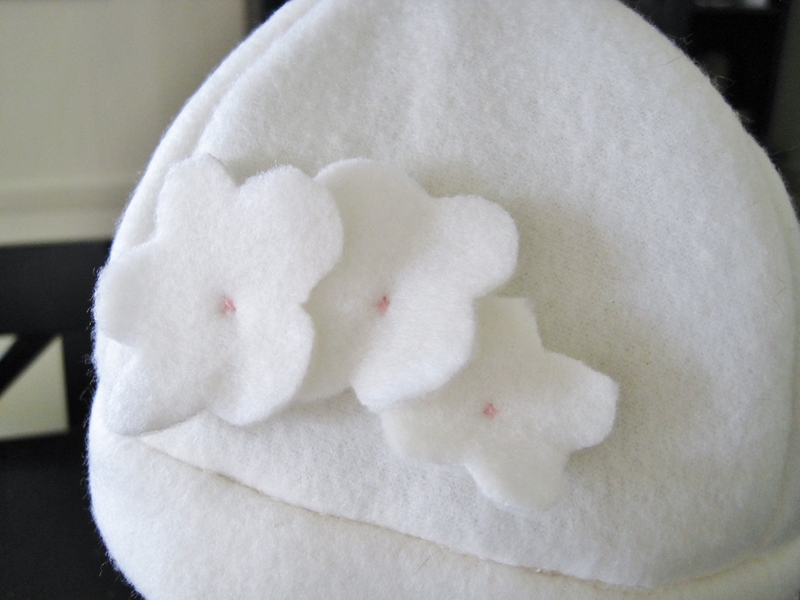 Since the registry had mostly items in neutral colors, I chose ivory fleece for the hat and decided to make it monochrome with ivory flowers. The pattern said to use purchased flowers, but really, flowers are pretty easy to make. I freehanded them and attached them at the center with pale pink embroidery thread. I have to admit, this is a pretty cute hat. In fact, I could only think of one thing that would make it cuter. Oh yes–ears. I drew a simple ear shape and sewed the ears into the seams. I think they are a tiny bit too far apart, but overall not bad. This one is for the first grandchild of an awesome friend. I wanted to line it with ivory fleece, which I used for the ears, but there wasn’t enough. Instead I chose a blue, ivory, and brown print that is a decent, if not perfect, match. I meant this to be a shower gift, but the baby was just born so I need to get this in the mail soon! These hats were lots of fun to make and the pattern is really easy to customize. They do seem a bit large, though, so I think the recipients will need to grow into them. Just in time for my sister-in-law’s baby shower, I made a few more gifts to go with my fleece baby washcloths. I noticed that her gift registry included burp cloths, so I made her three of them using fabric left over from other projects. The blue seersucker is from a dress I made for my niece and the owls are from a skirt for my sister. The pink striped cotton is from an old pair of pajamas. I just cut 9 X 18-inch rectangles for these–so easy! I also made a little pair of fleece booties using this pattern. I used fleece instead of felt and machine-stitched them with the seams on the inside. It took three tries to make these look decent. Even though fleece is very forgiving, it is difficult to keep the right shape while sewing tiny pieces. Furthermore, the fleece has to be sturdy enough to stand up a bit. These were great projects for using up scraps and they were quite fun to make. My brother and sister-in-law are expecting a baby this spring, which is exciting news because it means I get to make cute things. After taking a look at their registry to see the types of things they needed, I decided to make some washcloths. Inspired by this tutorial, I decided to add a little pocket to the corner of each one. This will make them easier to hold on to when washing and give them something to hang from to dry. These were super easy. I used bright fleece for one side and plain white flannel (left over from some quilts that Jared made) for the other. I made the little pockets of the white flannel and some green seersucker left over from this little sundress. For the cloths, I cut 8-inch squares of the fleece and flannel. The pockets were 4-inch squares cut on the diagonal. I sewed each piece of seersucker to the flannel backing along the diagonal edge, turned it right-side-out, and sandwiched it between the squares. I didn’t need to use pins because the flannel and fleece stuck together nicely. I thought it would look strange to not topstitch around the pockets, so my pockets cannot be used on either side, like those in the tutorial I found. On the first two that I made–the yellow one and the pink pattern–the topstitching is a bit janky. The two later ones, both green, turned out much better, I think. Although I know these are going to be used to wipe up baby messes and don’t have to be perfect, I think I might redo the yellow one. Over the weekend I finished another bag–my last one for a while. This one is for the awesome friend who gave me the Saint Sebastian pin cushion. I haven’t given it to her yet, but don’t think she reads or even knows about this blog so I should be safe. But just in case, Wendy, if you are reading, stop now! This is just a straightforward bag of the type I’ve made many times before. Wendy wears a lot of blues and purples, so I looked for something in those two colors. I ended up using the same fabric as for my sister-in-law’s bag because I really love the color and the pattern. For the lining, I used a simple lavender print. The straps are natural cotton webbing. I have a feeling Wendy will be carrying books in here, so I wanted to make sure the straps were strong. There is one exterior pocket and two narrow pockets on the interior, including one for pens and pencils. It was nice to have something turn out well after my hat failure. Now that I’ve done a lot of sewing for other people, I hope to make a few things for myself in the coming weeks. I had an awesome plan for handmade gifts for my dad and brother. I was going to make some winter hats. They would be made of knit (old sweaters) and lined with fleece, and best of all, they would be reversible. They would be soft, super warm, and awesome. For the first hat, I got one of Jared’s hats and traced it to make a pattern, then cut the pattern from both materials–an old beige cardigan and some super-soft royal blue fleece. Each went together nicely and looked like a hat. So far so good. Then, I sewed them together. I thought a zigzag stitch in royal blue would look nice. However, this was absolutely the wrong choice. I’m not sure what happened, exactly–I think I may have pulled the material too much when sewing–but the zigzag stitch flattened both materials and sort of stretched them out, giving the whole thing a scalloped edge that sort of looked like an old bonnet or ruffly sleeping cap. It was…pretty bad. See for yourself. It gets even worse when reversed. Fortunately, although I started this project the day before the family gift exchange, I did so early enough in the day that I had plenty of time to go shopping for real gifts. The moral of the story: I’m not sure, exactly, but I suspect it involves an actual pattern. I still think the basic idea is salvageable, but it will be a while before I attempt it again.